Classic-Castle.com • View topic - LCC - Outlaws, "The Discovery"
LCC - Outlaws, "The Discovery"
This small vessel is something I threw together. I recently built a SpongeBob set "The flying Dutchman." I had built it as I was looking for some ideas on building really small vessels for my storyline in the LCC found in our Roleplay and gaming section of this wonderful forum. Anyway, I thought building that SpongeBob set would really help me see what I wanted in my small vessel. After building it, I thought to myself, "I could really improve this neat little boat." so I made it a little deeper, just slightly longer, gave it a suitable staircase, and working cabin with workspace (and a sharp sword!). Whether or not I improved the ship is debatable. However one thing is certain this little vessel was a blast to create. Without further ado, here is my little boat, "The Discovery." C&C are very encouraged! The only line of defense for this ship are the one in the crow's nest and the one on deck, both, presumably wielding a crossbow for longer distances. If the ship were to get close to land (or another smaller vessel) the mounted spear on the front (serving as more of a sign of colors) can be removed and used to strike for closer distances (or push off those pesky jellyfish!). I have decided to go back and smooth out those studs on the steps with tiles. I am thinking to replace the hinge bases with black instead of the light bley right now. Also I think replacing the white clips on the sail with black ones would look good. I am looking for ways to cover the black hoses with brown, but nothing immediately comes to mind. I would rather not paint them if possible. Re: LCC - Outlaws, "The Discovery"
I think it would look better if it was longer and the back was smoothed out a little. I must say that it is rather cute as it is. Sweet design, and though small, very cool. 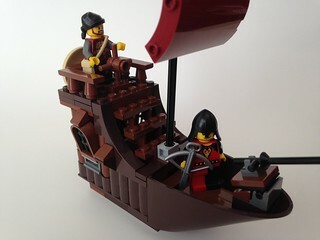 Nice little boat design, looks great! Thanks for the comments and critiques guys! Cute! Before reading the description I thought "that ship looks familiar"... 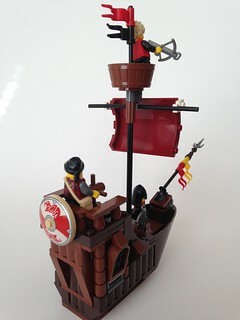 I'd also bought the spongebob set hoping that the ship could be repurposed and recoloured as a 'classic' pirate ship, but never really got round to it. The colour changes here work really well, though... How do they get into the cabin? (apart from swing round the side and into a window). For a moment I thought my LCC character had snuck his way into the crow's nest, but if you're heading to Garheim perhaps I could catch a ride! I wanted to build an entrance to the cabin in the ceiling, but as I tinkered with it, nothing would stand out. I plan on creating two more of these little ships, and I will play with various entrance points. I think it looks very cute. It would be more nautical if it was lengthened back and flattened bit Have you thought of an outrigger which could be used as a boat later ? I also imagined what could happen if the mast & crows nest fold down some how ? Might make hiding in the shallows easier ??? Looks nice though.